1. Keep the chef knife away from children. 2. Do not test the chef knife sharpness on hand. 3. Do not try to catch the chef knife with your hands if it slips or drops. 4. Do not use the chef knife to cut metal, wood and hard bones. 5. To avoid unintended injury, keep knife in sight rather than covering it with a cloth on the counter. 6. Keep the chef knife away from flame and high temperatures to avoid damaging the protective layer and handle. 7. Discontinue use when the blade gets dull. Sharpen the chef knife and resume use. This will keep the knife in the best condition. 1. For longer lasting knife, cut on a wooden cutting board. Cutting on a hard surface such as stone, metal, or glass may dull blade quickly. 2. Do not let your chef knife soak in water. We recommend washing your chef knife after using, then drying it immediately. 3. The chef knife is not dishwasher safe. To prevent injury when retrieving the chef knife from the dishwasher and damage to the chef knife handle, using a dishwasher to clean the chef knife is not recommended. 5. Store your chef knife properly. It is best to store it in a knife block or in-drawer knife tray. 6. 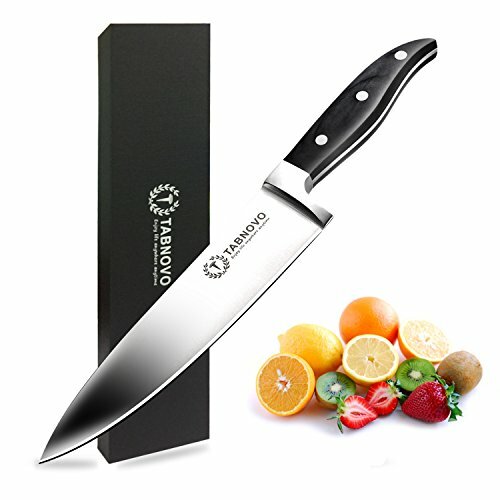 If the knife will be stored for an extended period of time, it is best to wipe the surface of blade with knife oil or olive oil to avoid rust. 7. Pleases sharpen the knife with knife sharpener, as necessary.